To successfully harness organizational data to business goals and manage data and data-driven applications so they deliver business value, enterprises need a comprehensive approach to managing data throughout its life cycle. 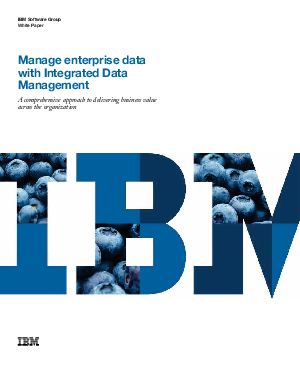 Integrated Data Management is an approach that can deliver those benefits. It helps enable organizations to manage enterprise application data—from requirements to retirement—across diverse environments. The benefits of such a solution include improved manageability, optimized performance, improved data privacy and protection and improved alignment—across IT roles and between business units and IT. It also helps enterprises control data management costs, reduce risks and maximize the performance of data-driven applications. Adopting an Integrated Data Management strategy can be a highly effective way to help IT support business growth, facilitate data governance and manage costs. It is also key to helping ensure that the enterprise derives maximum competitive advantage from its data.